I stayed in the habit of these walks until late April of this year, when my life was turned upside down one evening when I was browsing the internet and noticed something strangely sexist on Wikipedia. I wrote an op-ed about it for the New York Times, which caused an uproar, followed by a chain reaction, every element of which turned my life upside down anew. I became addicted to reading Wikipediocracy, especially its forum, which intelligently discusses and entertainingly lambastes Wikipedia’s problematic practices. Simultaneously, I got hooked on reading the drama-filled behind-the-scenes “inside” pages and “Talk” pages of Wikipedia itself, which span several years. When the time came for me to get back to focusing on my novel-writing, I felt unmotivated. I sensed I would miss not spending every waking moment indulging my addiction. So I came up with a solution: in my novel, I would incorporate a sub-plot about a fictional Wikipedia fight. Thrilled, I plunged back into my reading addiction, now calling it “research,” and no longer feeling guilty, because it was “work.” The fact that it was fun was none of anyone’s business; that was a private matter which I tried not to think about too much. Even sleep bored me compared to this trashy encyclopedia extravaganza. What little sleep I was able to get myself to do was done badly thanks to the lack of exercise. I was pleased with myself, though: I’d never “worked” so much. I’d never spent so many hours a day “toiling at my craft.” Maybe I even fit the definition of a “workaholic,” which was an ailment I’d often wished I had, the way some misguided people wished they were anorexics. This “work” travesty couldn’t fool me forever, of course. I finally realized that when research is so fascinating that you no longer care about writing the novel you’re doing the research for, there’s a problem. And on a physical level, I finally had to admit to myself: if I keep this up, I will die young. With perfect timing, The New Yorker published an article called “Walking Alive,” by Susan Orlean, offering a solution at least to the life-threatening part of my problem: a treadmill desk. I wouldn’t have to ever stop reading Wikipediocracy and the hidden pages of Wikipedia. I could keep reading them all day, every day, for decades more, without dying from it prematurely. I bet smokers, alcoholics and drug addicts wished they, too, had a way of making their vices harmless. I did a little investigating online. I stumbled upon a Twitter exchange between novelist Gary Shteyngart and Susan Orlean. I could not waste another minute. 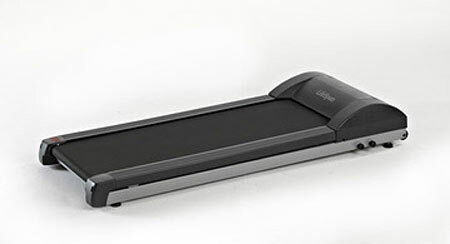 I went on the LifeSpan website and examined the models of treadmills available. What model had Susan Orlean gotten? Her article had mentioned the brand but not the model number. Finding out this crucial piece of information took work. It involved sending a Facebook FB +0.55% message to Susan Orlean, whom I didn’t know and was not Facebook friends with. She didn’t remember the model number, but said it was the heavy-duty version. I called the LifeSpan company. The guy who answered was pretty sure she’d gotten model TR1200-DT3, but he wasn’t sure enough for my taste, so he connected me to someone who was more sure, but still not sure enough for my taste, so I got him to image-Google “Susan Orlean” along with the word “treadmill” and asked him to examine the photo of her on her treadmill, which, I remarked, might not be model TR1200-DT3 because model TR1200-DT3 had silver on its side, whereas the one she was standing on had blue on its side. He said the blue was just a reflection off the silver. The company also offered a cheaper model and a more expensive one, but I wanted to get hers, because hers was obviously perfect. A more expensive ‘better’ model might be too good in a bad way. One had to be careful, in life, with “too good” because sometimes it was not as good as “good.” So I ordered model TR1200-DT3. LifeSpan LifeSpan Standing Desk Treadmill model TR1200-DT3. It arrives a week later. I’m so excited. So is Richard. The box is big and heavy. Getting it into my home office is very difficult. Even sliding it is impossible on the carpet. Richard and I manage to get it onto a towel, and I pull the towel while Richard pushes the box from behind. Then getting the treadmill out of the box is a whole other ordeal. Challenging to do all this without injuring oneself. It would be a shame to get injured on the day the treadmill arrives and then not be able to use it for weeks or months. We’re aware of this, so we’re very careful. We do a great job of it. We position the treadmill under my desk. It does make my office even more cramped than before. But that’s ok, it will be so worth it. I will finally be moving for the first time in weeks. Before trying the treadmill, I follow the instructions to the letter, I do all the required preparations, including the important spraying of silicone lubricant under the walking belt. And then, as I’m going from one side of my office to the other to get something, I don’t realize the treadmill is sticking out quite as far as it is, and I stub my pinky toe on it. The pain is far worse than any other toe stubbing I’ve ever experienced. I know instantly my toe is broken (confirmed a week later by x-rays). After a few minutes, the pain has subsided slightly, just enough for my excitement about the treadmill to return. A broken toe is certainly not going to hold me back from trying out the treadmill. If I’d broken both legs instead, I would be lying down on my stomach on the treadmill right now, turning on the machine to low speed, and dragging myself forward on my forearms. So with trepidation, I carefully step onto the walking belt, turn on the machine, and limp along for a while. It’s damn wonderful. So smooth. So sturdy. Such high quality. Just like all the customer reviews and Susan Orlean said. There’s only one thing everyone lied about. They said the treadmill made very little noise. Not true. “Very little noise” implies some noise. This machine makes no noise. Granted, I’m a bit hard of hearing, but not that hard. Perhaps if I were to squat down and press my ear against the motor I would be able to hear a faint purring sound, I don’t know. Ok, I’ve just done it. There was an extremely faint sound which I could only make out when I pressed my ear so hard as to create a kind of suction cup against the casing of the motor. The sound I heard was not even a purring, but a gentle ethereal whirring. One of my goals in life is to not outlive Richard. The sadness of losing him would make my existence intolerable. (The silver lining of dying young is you don’t have to experience the death of your loved ones.) The treadmill poses a bit of a problem in that respect. I estimate it will add approximately five years to my life. Therefore, it is essential that I add five years to Richard’s life as well, by making sure he gets the same treadmill for his desk. Luckily, I know Richard very much wants one, too. Last week, I heard him roar from his toilet seat. I rushed to his aid, fearing he was having a terrible medical problem, a seizure or worse. But he was simply roaring with laughter while reading the Susan Orlean article I’d insisted he read. He was especially amused by the part describing her and her husband wearing pedometers and sneakily trying to outdo each other on their total daily step counts. Richard could relate because we had done the same thing a couple of years ago. Emerging from the bathroom, he agreed we absolutely had to get treadmills for our desks. We decided I would buy one first, to see if we liked it, and if we did, he’d buy one too. Today, when the treadmill arrived, it was love at first step. In my case, love at first limp. But unfortunately, I’m realizing now, there’s a problem. A half inch problem. I just checked, and the treadmill is half an inch too wide to fit in the opening under his desk. Tragic! The cheap ugly desk I created for myself when I was nineteen, and which has been my only desk ever since, poses no problem as it’s just a large black board resting on top of two black metal filing cabinets (I turned it into a standing desk by piling plastic drawers and more boards on top of it). Its width is flexible, it can accommodate a treadmill, it can accommodate a spaceship. Richard’s desk is a real desk, all in one piece, made of beautiful brown carved wood. I always envied him his desk, wished I’d bought the same one, but something had held me back, a feeling I can only describe as a premonition. I spend the afternoon icing and elevating my broken toe (after buddy-taping it according to internet instructions) while searching online for a slightly narrower treadmill for Richard to accompany me on my extended life journey. I finally find one: The Tread, by TreadDesk Inc. That is the one he will have to get. I have a feeling it will be noisier and less durable than mine, but hopefully it will be good enough. One of my friends calls. She’s upset it’s been weeks since we’ve done a walk ‘n’ chat. “I’m not sure how easily I could chat while swimming,” she says. We leave it hanging, like people who say, “Let’s have coffee someday!” “Yes, let’s!” I don’t tell her how I broke my toe. I don’t want her to know I got a treadmill. I’m afraid she’ll see it as the end of an era. The end of the walk ‘n’ chat era. A betrayal. My announcement, when it comes, will have to be carefully formulated– something along the lines of: “I got a treadmill because I decided that one hour of walking in the park every day is not enough and that I should walk several more hours on top of it, while writing.” I will not tell her of my addiction to Wikipedia and Wikipediocracy, otherwise she’ll suspect she’ll never see me again. On the second and third days of my treadmill ownership, I limp on it approximately an hour each day. I know this because the readout says it. I love using the treadmill while typing, while reading the latest dramas on Wikipediocracy and Wikipedia, and while writing this article. If you have a broken toe (even a pinky toe), the internet says to stay off your feet for weeks and avoid walking. But seriously, how can I? It’s absurd, it’s nonsense, I’m not going to sit on my couch for weeks while my beautiful new treadmill is staring at me in the face enticingly. I just can’t do it. Can’t, can’t, can’t. No, no, no. On the fourth day, I limp on it for three and a half hours! Wow. I didn’t even notice. When have I ever walked three and a half hours in a day and not noticed? I’m seriously wondering if the readout is functioning properly. I really didn’t want to go to a doctor for this, but seeing how awful it looks and frightened by some stories I read online about people who were in pain for the rest of their lives after their broken pinky toes didn’t heal properly, I end up going to two doctors. First, I see my minimalist in-network doctor who always tries to stop me getting the tests I want. He probably won’t want to let me get my toe x-rayed, but since he lives right nearby and can always see me right away, that’s who I go and see first. He’s predictably amused when he hears I broke my toe on the treadmill I bought to exercise while writing. I ask him if I could get my toe x-rayed. He says, “X-rays don’t really serve any purpose for a broken fifth toe except to give you bragging rights.” Ashamed, I don’t mention I’ve been so certain my toe is broken that I’ve been bragging about it without having the legal documents to back it up. I ask him if I can still use my treadmill. He says no, not until my toe heals. He says I should try to stay off my feet. I ask him if I can use a recumbent stationary bicycle. I examine the x-ray transparencies after I take them home with me. They look alarming to me, and I hear from the doctor the next day that the toe is officially broken. A couple of days later I go and see a foot expert at the Hospital For Special Surgery, just to put my mind completely at ease. In the waiting room, I have to fill out all the forms as though I’m a new patient, because even though I’ve seen this doctor once before, for vague foot pain, that was four years ago. Like most writers who complete doctors’ forms and customs forms, I take a certain amount of pleasure filling the “Occupation” box with the word “Novelist.” It reminds me that, in the world beyond my home office, I am, officially, a writer. Being a “Novelist” is an occupation one can claim only after making a serious commitment to one’s craft and one’s career. I’m stressing this point for the benefit of the few Wikipedia editors who still don’t understand why I got so upset when I discovered that women novelists on Wikipedia (including myself) were being dragged out of the big, main Novelist category (where only men were allowed to stay) and dumped into the smaller Woman Novelist sub-category, and why I had to go and write about it in two NY Times op-eds (followed by a piece in The Atlantic) that created quite a stink for Wikipedia. So, let me explain to you (dear few Wikipedia editors who don’t get it) why I had to write those op-eds: all that work I did, devoting my adolescence to writing novels, earning an MFA in Creative Writing from Columbia University, living a hermit-like existence for decades dedicated to my writing, was not done just so I’d end up with the diminished pleasure of having to write ‘Woman novelist’ in the Occupation box on doctors’ forms and customs forms. The doctor asks me the reason for my visit. I tell him I broke my toe on my writing treadmill ten days ago. He, too, finds that amusing. “Or probably even one hour, right?” I say. “No, it’s ok to walk on it. Use pain as your guide. If it hurts only a little, walk. If it hurts a lot, don’t walk.” I wonder why he thinks that’s an effective guideline. Pain is subjective. Doesn’t he realize that when someone gets an exciting new toy, like a treadmill, the scoring of pain tends to conveniently change? When I filled out his admission forms, I had scored my pain a 5 out of 10. That was truthful, maybe even a bit of an understatement. But now, as I leave the doctor’s office, I’m revising the scoring in my head. I’m seeing it as more of a very tolerable 2.5. Especially if it means I can rush home and get back on my writing treadmill.